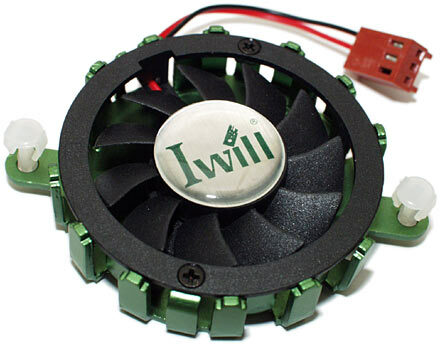 Review: Iwill KK266Plus-R and MSI K7T Turbo-R Limited Edition Socket A motherboards. Review date: 14 August 2001. Via Technology's KT133A chipset is the ported and polished version of their original KT133. 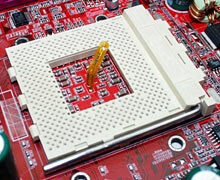 It's a popular family; some KT133 variant powers most of the Socket A (Athlon or Duron) motherboards in the world today. The KT133 chipset series, though, only supports Standard Data Rate (SDR) memory. Which, these days, generally means PC133 SDRAM, with half of the raw bandwidth of "PC2100" Double Data Rate (DDR) memory. Oddly, though, DDR generally delivers a pretty underwhelming speed improvement for desktop computer tasks. 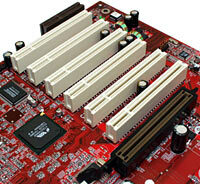 So the type of memory a Socket A motherboard supports isn't a hugely important criterion for many buyers. Well, if it is, it shouldn't be. 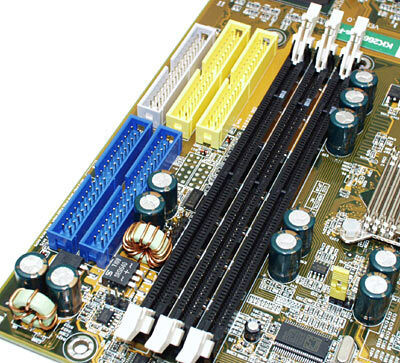 The rest of the motherboard feature set ought to carry more weight for most people. How overclockable the motherboard is, for instance, or whether it has a second on-board IDE controller, or whether it's got built-in audio or video. That sort of thing. If you're looking for winners in all of these other departments, you can find them powered by the KT133A. Here are a couple of high-spec KT133A boards, at least one of which also cuts it in the high style department. Iwill's KK266Plus-R has about as many features as can be crammed into a KT133A board. There's a RAID-capable IDE controller on top of the standard two-port KT133A controller, so you can plug in up to eight IDE devices (all of which can be running in Ultra DMA/100 mode, if they support it) without needing to add a controller card, and you can also do multi-drive array tricks, of which more shortly. And this KK266 also has built-in sound that's several cuts above the average. And now, the red one. I was always under the impression that blackness was what made computers faster, and that redness only worked for cars, but MSI seem to disagree. Their named-like-a-sports-car K7T Turbo-R Limited Edition is bright red. If you're building a normal PC, your motherboard can be green, orange, red, blue or purple with pink spots and it'll make no difference to anything. If you're building a show-off box with neon illumination and a window in the side, though, you may be feeling an urge to buy this board already. It's unquestionably a lot snazzier looking than your usual green or off-yellow item. People who like some substance with their style will be pleased to learn that the K7T Turbo Blah Blah Blah has a similar feature set to the KK266Plus-R. Practically identical, in fact, except for plain vanilla built-in sound, and the addition of an interesting USB networking option. So let's bounce 'em off each other, shall we? 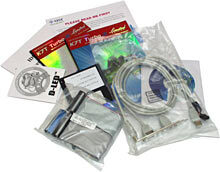 The KK266Plus-R comes with a couple of 80-wire IDE cables (which you need, if you want to use Ultra DMA 66 or 100 hard drives at full speed), a normal floppy cable, decent documentation, a driver/utility CD and a special audio bracket, of which more in a moment. The KK266 does not come with the cable and bracket you need to use the second pair of USB ports which the motherboard supports. There are two ports built into the normal ATX connector block on the back of the board, but this board, like most others these days, can give you two more if you've got the right gadget. Some motherboards give you said gadget in the box; this one doesn't. The K7T Turbo-R LE also has decent documentation too (including an unusually complete paper manual in English, and a simplified manual in multiple languages), but it stingily gives you only one 80 wire IDE lead in the bag with the floppy lead, and also has no extra USB port bracket included. Instead, you get a weird-looking USB whatsit whose back panel bracket has one type A USB socket (the rectangular ones) and one type B socket (the squarer variety), with cables coming from each socket that terminate in the same sort of plug that normal extra-port boards use. This funny looking thing gives you one normal extra USB port - that's what the A socket is for. 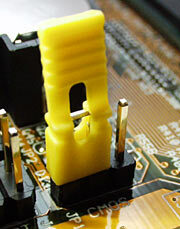 The B socket is for the K7T Turbo's USB PC to PC Networking function. Once you've plugged the end of the internal cable into this "USB2" header on the motherboard ("USB1" is present too; that's where you plug in a normal two-more-ports thingy, if you've got one) you can use a standard USB A-to-B cable (one is included) to connect a machine built around the K7T Turbo-R to a Type A USB port on any other PC. Then, you install the included "GenieLink" driver software on both PCs, and presto, the USB cable is a network connection. It won't quite have the performance of 100BaseT Ethernet, but it doesn't require any special hardware on the other computer, and the five metre maximum USB cable length should give you decent positioning flexibility. There's also bridge software supplied, which lets you connect the USB-linked computers to a regular LAN. To do this, you'll need to install a normal network adapter in the K7T Turbo-R machine as well. While we're on the subject of unusual extras, MSI's included one of their standard nifty features on the K7T Turbo. This little line of "D-LEDs" replaces the usual cryptic startup beep codes that most motherboards use to tell you when something's not right with the basic system setup. The LEDs are all bi-colour - they can light up red or green - and they light up in different patterns while the system starts up, and settle down to all green when the power-up process is complete. You still need to refer to the motherboard documentation to find out what the codes mean, mind you, and they're no use to you when the lid's on the computer case. But they're still handier than beeps, which is why MSI keep using them on this and other MSI boards, like the older 6330 I review here. If beeps do matter to you, by the way, the K7T Turbo-R LE has a little built-in speaker as well, which doesn't seem to be mentioned in the manual. So you don't have to connect the case speaker if you don't want to. Both of these boards have three slots for standard SDR DIMM memory modules, and can accept up to 1.5Gb of RAM - three 512Mb modules. 512Mb DIMMs are still rather expensive per megabyte compared with smaller capacity modules, but 256Mb PC133 modules are currently selling for only about 1.5 times the price of similar quality 128Mb modules. With all SDRAM prices at rather attractive levels now, it's thus no big deal to get 768Mb of RAM onto either of these boards. Which is a heck of a lot more than most people need, of course. But if you're doing RAM-hungry things like pro graphics or video work, heavy multitasking, manipulation of giant databases or simulating a brutal gladiatorial spectacle, getting slabs of RAM on the cheap has never been easier. It'd be nice if these boards had a fourth RAM slot, allowing 1Gb of RAM without forcing you to get a pricey 512Mb module. But most people are unlikely to care. 256Mb is more than enough for most of the world's Windows PCs. Both of these boards have on-board sound, but the KK266's is rather more spectacular than the K7T Turbo's. In the olden days of, oh, about a week ago last Thursday, sound hardware built into motherboards was not a great thing. It often used cheap and nasty chipsets that might or might not work properly with whatever OS you wanted to use, and which were sometimes cantankerous about stepping aside when you tried to install a proper sound card instead. These days, built-in-audio motherboards are a pretty safe bet, as long as you don't want anything all that special. The K7T Turbo's setup is par for the course, with three standard 1/8th inch connectors on the back panel (line out, line in, mic in), and four-pin connectors on the board for up to three internal audio sources, like the analogue output from a CD-ROM drive. If you want hardware accelerated positional audio and similar frills then you won't get 'em; this is just the normal Via 686B AC97-compliant sound package. But it'll serve, it saves you some money that you'd otherwise have to spend on a sound card, and it can be easily disabled if you want to upgrade. The KK266, on the other hand, has audio as one of its prime selling points. It has, as standard, a C-Media CMI8738 MX sound chip, which is an all-singing, all-dancing, all-features unit that should please gamers, home cinema enthusiasts and people who want to use their PC as a dirt cheap audio workstation. If all you care about is positional audio for games, the CMI8738 should do nicely. It supports DirectSound 3D and A3D 1.0 for positional audio, and EAX 2.0 for environmental effects; for best results, just plug in your headphones and you'll be away. If you want more outputs, though, the KK266Plus-R can oblige. It has the same three built in sound input and output connectors as the KT7 Turbo, and every other ATX motherboard with built in sound. But the KK266 also comes with an extra sound output bracket which you can install in any empty slot location on the back of your case. The bracket has two more 1/8th inch sockets on it. One of these connectors gives you rear (surround) speaker output, and the other one provides the centre and subwoofer channels, bringing the total up to a full home-theatre-compliant five-point-one channels. The centre speaker output is on one channel of that last stereo connector, and the subwoofer output's on the other channel. You can move a couple of jumpers to select which "side" each output's on. Any software that supports the CMI8738 chipset will work in 5.1 channel mode with the KK266's audio output. You don't get any DVD playing software with the board, but that's not a problem, since you often do get such software with DVD-ROM drives and video cards. CyberLink's popular PowerDVD is probably the most frequently bundled DVD player packages (many hardware enthusiasts end up with several copies...), and it supports the CMI8738. 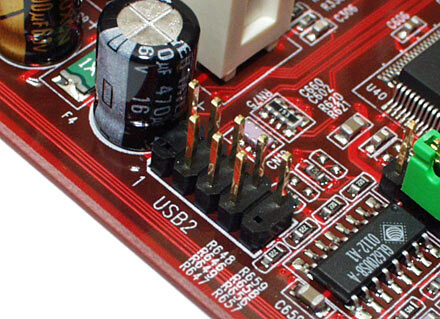 If you want digital inputs and outputs, the CMI8738 can do that too - but to get the actual connectors to do it, you need to buy an optional "SuperAudio" bracket to replace the standard one. The SuperAudio bracket has the same two 1/8th inch sockets as the plain bracket, but also gives you two RCA S/PDIF (Sony/Philips Digital Interface) connectors, and two optical ("Toslink") connectors. Each connector pair has one input and one output. ...that comes with the driver install. Which, by the way, asks you whether you want to install the outdated 7.1a version of DirectX, and then does it anyway when you say no. The Advanced options panels for the KK266's sound configuration have a normal Windows look, thankfully, and let you fiddle with various features. This is where you tell the audio system what sound output setup you've got - two speakers, four speakers, six speakers or headphones - and set the levels for the different channels. There's a "virtual 5.1 speakers" option that uses Head Related Transfer Function (HRTF) jiggery-pokery to make fake surround out of two channel output, and you can also set volume control hot-keys so you can change the Windows volume level while you're playing a game. If you've got the SuperAudio add-on, you can toggle S/PDIF loopback - where whatever comes in the input goes out of the output as well. You can also monitor the S/PDIF input, sending the S/PDIF audio signal out of the analogue outputs. There's toggleable "Copyright Protection", which I presume allows you to decide whether you want the audio hardware to pay attention to SCMS (Serial Copying Management System) data or not. You can also toggle whether you want your S/PDIF sample rate to be 44.1 or 48kHz. 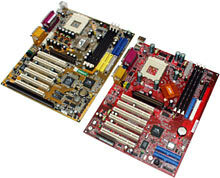 For most people's purposes, these two motherboards have identical IDE-drive-connecting capabilities - but they are actually different. 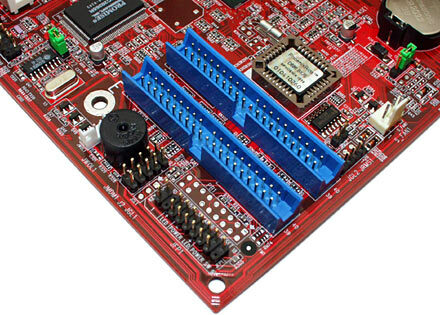 The first two IDE connectors on each board are run by the KT133A's standard IDE hardware, which has full UDMA/100 capability. But the two boards have different controllers for the second two connectors. The K7T Turbo-R has a Promise controller. Promise are the leading brand in the basic-IDE-RAID market, and their controllers generally have fewer... issues... than the Highpoint Technologies controllers on many four-connector boards. This Promise controller is a PDC20265R with a "Lite RAID" BIOS, which can apparently be tweaked, if you're feeling brave, to give it more features. The KK266Plus-R's second IDE controller isn't a Highpoint, either; it's an American Megatrends (AMI) AG 80649. The K7T Turbo-R LE has its second pair of IDE connectors down here in the corner of the board, which is unusual, and good. Multi-connector motherboards with all of the connectors in the usual spot near the RAM slots - like the KK266, and pretty much every other dual-controller motherboard - can be annoying to set up; you tend to get a cable snarl. Here's the KK266's drive connectors, which have exactly this problem. It's not tremendously difficult to get all five cables in place on a board like this, but it's something I wouldn't mind never having to do again. Connectors down in the corner can be a problem if you want to hook them up to UDMA/66 or UDMA/100 drives in the top of a tower case, because 80 wire IDE leads can only be 40 centimetres long. If you've got drive bays within range of the connectors, though, the K7T's arrangement is an elegant one. Both of these controllers let you connect up to four separate IDE drives of any type, just like the standard IDE connectors, if you don't want to use any RAID features. They also support the same two basic two-drive RAID modes (well, unless you've been fooling with the Promise controller's BIOS). RAID 0 is non-redundant striping, which adds the capacities of identical drives together, but at the cost of one drive failure killing the whole array's data. RAID 1 is mirroring, where the data on one drive is duplicated on another drive, for security. The KK266's RAID controller also supports RAID 0+1, which is both modes together, with the speed of striping and the security of mirroring. You need four drives to use it, but at least you can; for some reason the K7T's Promise controller doesn't support 0+1, unless you fiddle the BIOS. Frankly, I think Promise are asking for people to do these "back door updates", when they cripple their entry level controllers this badly. Both of these boards can be had in slightly cheaper versions that lack the second pair of IDE connectors. The price difference is small enough, though, that a lot of distributors probably won't bother carrying both versions. If you only need four or fewer drives and don't want the boot delay the extra controller causes, you can just turn it off in the BIOS setup. The KK266 has a standard slot complement for a modern motherboard - one AGP, six PCI. Good luck installing a card in every PCI slot and ending up with them all playing together, but at least you can try. At the end of these modern slots, though, there's a throwback to days of yore - an ISA slot, sharing a back panel connector with PCI slot number 6. 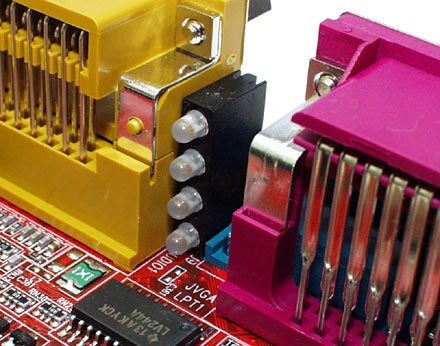 If you've got an old ISA card that you don't want to replace with something newer, or if your old ISA card is some oddity that you can't replace with a PCI unit, then the KK266 will let you keep using it. It's becoming difficult to find high performance motherboards with even one ISA slot, so this one feature could make the KK266Plus-R a must-have for some buyers. 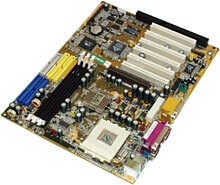 Lots of motherboards have some kind of other slot at the end of their PCI collection, though. It's just not usually good for anything much. Take the last slot on the K7T Turbo-R, for instance. Once again - one AGP (this time with a card-retaining clip that engages the slot on the back of your video card), plus six PCI. Plus one little CNR (Communications Network Riser) slot at the end, into which you can plug a few super-cheap host-based modem or network cards, which aren't available in retail channels because they're not enough cheaper than PCI alternatives that people assembling fewer than a hundred computers should care. While we're in the stuff-not-many-people-use department, both motherboards also have Wake-On-LAN, Wake-On-Modem and IrDA headers, and the KK266 has an SMBUS connector as well. The K7T Turbo-R has a reasonably straightforward case connector pin block, where you hook up your case's lights and switches. But the KK266 could be a bit friendlier in this department. Here's its case connector pins. Even the best labelled of these things tend to be annoying, especially for new users, but the KK266 manual goes out of its way to confuse you. There's no simple this-connector-goes-here diagram; instead you get a picture of the pin-block with its pin numbering scheme indicated, and a table with the pin numbers on which different connectors fit. Count to the right pins yourself. Oh, yeah - don't expect simple "+" and "-" annotations, either. Iwill know what an anode and a cathode are, and expect you to know as well. Another thing that irked me mildly about the KK266Plus-R, while I'm venting, was that my review board came with its built-in USB ports disabled in the BIOS. I've seen motherboards that come with some (or all!) of their IDE channels set to "None" in the BIOS, which can have newbies playing where-the-heck-is-my-drive games for some time. But disabled USB is a new one on me. It's the work of a moment to go into the BIOS setup and fix the problem, once you know it's there. But given the number of other USB hassles that have been known to happen on Via-chipset Windows PCs, "the controller's turned off" was not the first thing that sprang to my mind. On the plus side, important jumpers on the KK266, like the Clear CMOS one here, have these nifty tall yellow jumper blocks with a pull-tab. The CCMOS jumper on most motherboards has a plain hard-to-grab jumper on it; that's all you get on the MSI board. Some boards just have a couple of solder pads that you have to bridge with a screwdriver. An illuminated toggle switch with "Better luck on the next overclocking attempt!" written on it in cheery letters would be better still, but I'll settle for these jumpers that I can easily use. Performance-wise, all KT133A boards are pretty much precisely the same, provided they can get their CPU and other components up to the same speed. Whether they can do this depends partly on the adjustment options provided, and partly on the physical design of the board - running at higher-than-specified speeds requires better-than-standard motherboard design. Both of these boards have imposing CPU power supply sections, with big smoothing capacitors and multiple regulators. They also both keep the big caps away from the CPU socket, so overclockers should be able to use pretty much any giant air cooler on their CPU without it fouling any other components. Both of these boards support CPU multiplier and voltage adjustment (up to 1.85V on both boards, in 0.025 volt increments) and Front Side Bus (FSB) adjustment as well (both of them give you more adjustment range than you'll be able to use, in 1MHz increments). Both of them also let you tweak these settings in software, using the BIOS setup program. They also both have hardware monitoring capabilities, so you can track fan speeds and your CPU temperature. Since Socket A CPUs before the "Palomino" core Athlons don't have an internal thermal sensor, motherboards have to use an external sensor, which is usually just a little thermal probe sitting on the motherboard in the middle of the CPU socket. The KK266's CPU temperature probe is a standard blue-blob unit, but the K7T has this super-thin flexible probe. I've no idea whether it'll actually work better; I doubt it, to be honest, because all motherboard CPU thermal sensors I've seen are useful only for vague comparative readings. They never give you much of an idea about the processor's real core temperature, and you can't compare readings across different motherboards, even if they're boards of the same model. Small differences in probe positioning can make big differences to the temperature it detects, and the calibration of the probes on some motherboards has been known to change dramatically between BIOS versions. A feature that'll matter more to overclockers is that neither of these motherboards have completely software-based CPU speed configuration. Like many other KT133 boards, these two each have one jumper that you'll need to check, whether or not you want to overclock your CPU. That one jumper selects the base FSB the board uses - 100 or 133MHz. By default, older Socket A Athlons and all Durons use a 100MHz FSB. An 800MHz Duron, for instance, has an 8X multiplier as standard; eight times 100 is 800. Newer Athlons with the "C" designation use a 133MHz FSB. They'll work at 100MHz, but won't run at full speed. If you have the FSB jumper set to 100MHz and plug in, say, a 1.33GHz Athlon (which will want to run at 133MHz FSB with its stock 10X multiplier), you'll find that it only runs at 1GHz - ten times 100MHz. The problem arises when you're trying to overclock a chip that has a 100MHz stock FSB, and run it at 133MHz FSB, on one of these motherboards that sets the base FSB with a jumper but has all of the other adjustments in software. If you've unlocked the CPU multiplier - some Athlons and Durons come with an unlocked multiplier from the factory, but all of 'em can be easily unlocked at home, via the method I explain in my older Socket A motherboard comparison here - then you can use a 133MHz FSB on a chip made for 100MHz, even if that chip's core can't actually handle a 33% overclock. You just reduce the multiplier a bit when you wind up the FSB, so that instead of running at its stock speed of, say, 10X100MHz, it now runs at, say, 9X133MHz. 9X133MHz will give you a 1.2GHz CPU (not 1197MHz, because "133MHz" is actually 133 and a third megahertz). You'd get the same core speed by using 12X100MHz. But the higher FSB, lower multiplier option gives the CPU faster communication with the rest of the system, importantly including the RAM, for somewhat better overall performance. If you're shooting for really high core speeds, you have to use 133MHz or higher FSB speeds, because the multipliers only go up to 13X. Which, confusingly, is what you get when you ask for 12.5X. As has been noted elsewhere, though, this can cause a problem. 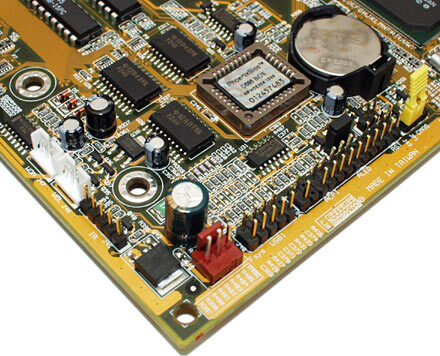 KT133A motherboards with a 100/133 jumper will always start up at whatever FSB the jumper's set to, which is fine. But at the very start of the boot process, they use the CPU's default multiplier - not the lower one you've set in the BIOS configuration. Which can be bad, if you're using a 100MHz FSB CPU that can't run, even for a moment, at its default multiplier from a 133MHz FSB. The motherboard sets the multiplier to the software-configured setting only a little way into the startup process, but it'll never get there if the CPU locks on power-up. If you're starting out with a C-type Athlon, of course, this doesn't matter. It'll work, no worries. And, as this Anandtech piece notes, you can also get around the problem by lowering your CPU's apparent default multiplier. Your average casual overclocker's unlikely to be crazy about all of that fiddly chip-scribbling, though. The way around this problem is to opt for a motherboard that has all of its CPU settings in software. Or, at least, one which allows you to turn off "jumper free" mode and set the CPU up with nothing but old fashioned jumpers and/or DIP switches. This latter option's definitely not preferable. Hardware CPU setup is fiddly and annoying, and it just can't give you the squillions of setup options that software setup can deliver. Well, not unless someone makes a hardware setup motherboard with dozens of DIP switches, anyway. High FSB speeds mean a hot motherboard north bridge chip. The K7T Turbo-R has a simple orange-anodised heat sink on its north bridge, and the KK266 I got for review had a shiny-plated passive heat sink there. But the Iwill board also came with this fancier active cooler in the box. Apparently Iwill will be providing these as standard equipment, to help overclockin' fools get their FSB up into the stratosphere. Bear in mind, though, that a redlined 160-odd-megahertz FSB is only 20% higher than the stock 133MHz, and a 20% increase in bandwidth to the RAM and to anything else that's goosed up by the FSB change will not make a big difference for most things that most people do with most PCs. Like games, for instance. If you've got good enough RAM and other components that 160MHz FSB runs rock solid, go ahead; it's not going to make anything slower. But FSB tweaking is only of minor interest when CPU multiplier adjustment is also available. The MSI board comes with their "Fuzzy Logic 3" software for Windows, which is supposed to automatically pick the fastest stable FSB speed. Heck, it might even do it. But this is still just FSB overclocking; you can do a lot better by unlocking your CPU multiplier and doing it properly. If you'd like some RAM tweaking to go with your overclocking, the K7T provides a "High System Performance" option in the BIOS that sets the RAM Column Address Strobe latency to 2. This can give a small performance gain in RAM-intensive tasks, but does nothing noticeable for most tasks and may not be supported by your RAM. There's also four-way memory interleaving, activated by default when you use the standard "DRAM Timing by SPD" option in the K7T's BIOS. Interleaving spreads memory access over different modules - actually, it can spread it over different sides of the one module, since, electrically, double-sided modules are two separate units. Interleaving can give a worthwhile speed boost for some tasks, but, again, you shouldn't expect miracles. It's very unlikely to cause compatibility problems, at least. The KK266 has explicit RAM timing and interleave configuration options; it wins by a hair in this department. Though, as you ought to have figured out by now, that's not likely to make a lot of difference to anything in the real world. A DDR motherboard with no memory tweaks applied ought to handily defeat an SDR board with every tweak in creation, for any task that leans heavily on main memory speed. Here in Australia, and in a few other smaller PC markets as well, you still can't get quality DDR memory for around the same price as quality SDR. In the USA, you can. Since the real world performance difference between DDR and SDR is generally small, there's good reason to settle for an SDR motherboard if you can't get decent DDR memory cheaply. There are a few "dual fuel" motherboards which can accept either kind of RAM - I review one here - which let you start with one kind of memory then upgrade to the other later. But they're more expensive. In countries where DDR is as dirt cheap as SDR, though - or for people who are happy to take their chances with importing their own RAM - the choice is less clear-cut. There's a good selection of DDR-only motherboards now with big feature sets, and you might as well get the extra speed, if there's nothing else you need. If RAM flavour considerations aren't first on your list of selection priorities, then both of these boards are great. The K7T Turbo-R Limited Edition is exactly what the doctor ordered, if you want a really eye-catching KT133A motherboard with an imposingly complete feature set, and USB networking thrown in. 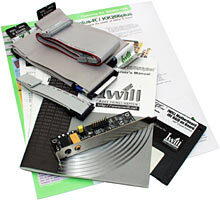 Got a laptop with no network adapter and don't want to pay for a PCMCIA one? 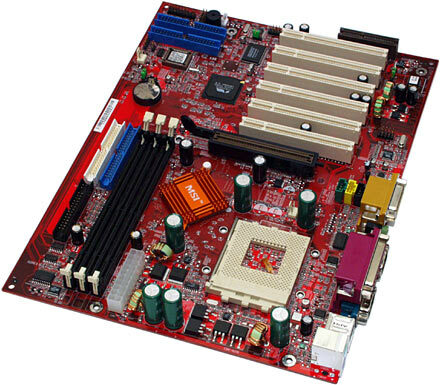 This board could be just right for your next desktop machine. The KK266Plus-R's core feature set is very similar to the K7T's. Its special feature is its high-powered built-in sound, which is likely to be interesting to the home theatre and home audio studio enthusiasts out there. The SuperAudio add-on's not terribly expensive, and it gives you a full set of digital ins and outs more cheaply than you could get them from any stand-alone sound card. For mainstream users, both of these boards have more features than you need, but they're not terribly expensive, so who cares? For overclockers, they're both great. Not perfect, but certainly not much of a compromise. If all you want is a basic business box, both of these boards are complete overkill. 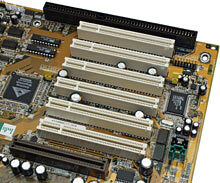 Consider a cheap all-in-one board instead, like the Asus A7VL-VM I review here. For more demanding purposes, though, these boards both get the Recommended stamp from me! Aus PC Market don't sell these boards any more, but they've got plenty of others! Best points: Looks great, goes hard!